I have to admit I’m pulling for Barack Hussein Obama. I don’t think he is any kind of saint or savior. He is just my favorite of the available choices. “You are a big Barack supporter aren’t you senator?” “Yes, I am,” replied the pride of Austin. “Name some of his legislative accomplishments,” Matthews asked. Watson demurred. “Sir, you have to give me his legislative accomplishments,” Matthews pressed. “You support him for president. You are on national television. Name his legislative accomplishments, sir. Can you name anything he has accomplished, SIR?” Watson stammered. “List Barack Obama’s accomplishments as a senator now. NOW.” Mathews commanded. Watson couldn’t. Tweety framed him in and nailed him. The poor guy looked like a deer in the headlights. When a pundit asks you a question, you cannot allow said pundit to frame the situation. If there is one thing I have learned by begrudgingly paying attention to the Neo-Con criminals currently at the helm, it is that you must be in control of the message at all times. The proper response to the above line of questioning could have been, “I’d need to look at some more specifics on Obama’s record, but I think the real issue here is Hillary’s Iraq stance, Hillary’s Kyl-Lieberman stance, Hillary’s choice of advisers.” Then you refuse to answer the question that plays into their framing, while refusing to back down from your frame. The Rockridge Institute has some great information about framing. If you wonder how the nation has been so bamboozled, look no farther than Little Piggie Karl Rove and his thorough grasp of framing and its effect on public discourse. They refuse to discuss anything off message. They show tremendous discipline to their messages, no matter how contrite or bold faced. In short, the Neo-Cons have whuped the Progressives’ collective asses at the communication game. Go check out George Lackoff’s article on Simple Framing. If we are serious about being progressive, we must beat the Right at its own game. 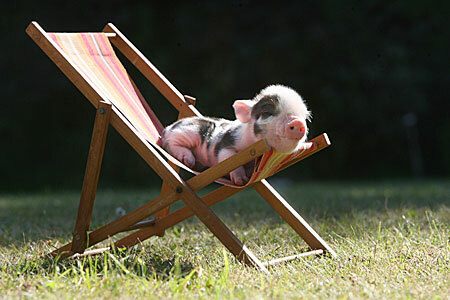 The Rove baby was a cute little piglet, huh?